The Slim Line writing implements make ideal travelling companions, being unusually sporty and easy to get on with. Thanks to a coating of the precious metal palladium, the surface is very hard-wearing and unreactive. All Slim Line models are equipped with a spring clip for pockets. In the case of the roller-ball pen and fineliner the cap can be placed on either end. Both are refillable. The other two members of the family are just as much a pleasure to write with. The propelling pencil is equipped with a user-friendly soft lead (B), 0.0 mm, and under the end cap is a fine white replaceable eraser. 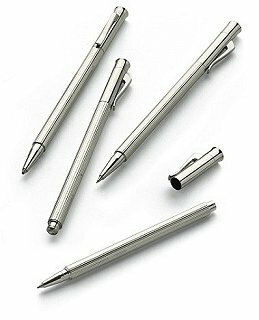 The twist-action ball pen has a top-quality black large-capity refill with line width B.